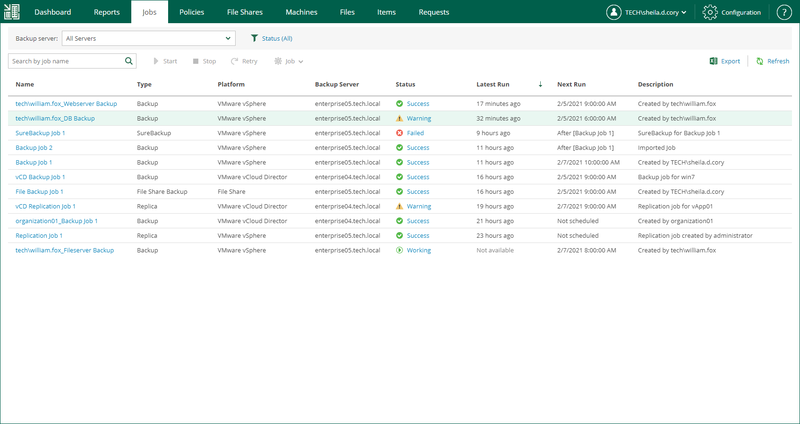 To view information about all jobs from managed backup servers, open the Jobs tab in the main view of Veeam Backup Enterprise Manager. Every job in the list is described with the following data: job name, type, platform of the machines it processes, backup server on which the job was created, current job status, date of the latest run, date of the next run (if the job is scheduled) and description. To see a list of job sessions, click the job name link in the Name column. To see detailed statistics on the last job run, click the state link in the Status column. You can export displayed information to a file using the Export button on the toolbar. This file then can be opened on the client machine using the associated application.